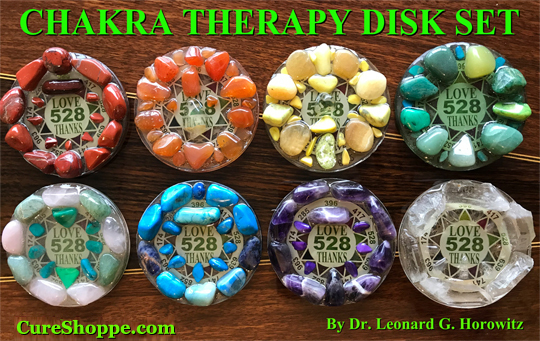 Video Instructional, Step by Step Plans Show You How to Manufacture Your Own Chakra Therapy Disk Set Pioneered by Award-winning Health Science Expert, Dr. Leonard G. Horowitz. Image shows finished set of eight 'Chakra Disks' (two for the Heart Chakra). Use your own artistic creativity and save hundreds of dollars. Learn from the most knowledgeable source of 'do-it-yourself' bio-energy equipment research and development, Dr. Leonard G. Horowitz, who collaborated with several of the world's most successful artists, jewelry makers, and scientists in designing and manufacturing several most amazing energy-generating products and equipment for natural healing. Place one or more Chakra Disks in the area(s) of the chakra(s) on either side of your body. Their natural gemstone color frequencies are supplemented by the “MIracle” 528Hz frequency radiating from the crystallized matrix made from non-toxic vegetable resin. Dr. Horowitz designed this ‘therapeutic art’ for ease of healing administration. The healing energy naturally radiates from the colored gemstones. The disks conveniently hold these stones where you place them, rather than having the stones roll off during treatment sessions that can last from 20 or 30 minutes to 1 hour. After 30 minutes, assess the pain or condition? It typically feels improved. If you're not sure, repeat the simple treatment. After 1 hour of simply relaxing with the Chakra Disk in place, you will be amazed at the disappearance of the pain, dysfunction or experience noticeable improvement. The benefits typically last for several days. The treatment can be repeated any time without fear of "over-doing it." The stability and safety of the design enables self-applications as frequently as you like. This video instructional, supplemented by detailed text and graphics, guides you with step-by-step directions to manufacture your own "Chakra Disks," as well as beautiful and functional medallions, other crystalline art forms, and useful frequency-generating products. Save more than $300 here by making these yourself. We sell these sets (special order - custom made) for as much as $300 each. That's a total of $2,400. And you won't have the fun, personal touch, and artistic creativity 'experience' of making these yourself. Use Dr. Horowitz's easy-to-follow instructions. These commercially-valuable products are not hard to make. If you are a mildly handy good with your hands, and have an eye for color and form, you can have a blast making these, and even starting your own business selling them. Each of these Chakra Disks subtly vibrate and resonate colored elemental energies that are effectively used to balance each chakra (i.e., energy center in the body). This, in turn, helps balance and 'rehab' the natural flow of energy through your acupuncture energy meridians. The result is amazing. Apply these on your skin in bed. You will slowly-but-surely feel them "heating up." The energy is soothing, relaxing, and healing. Back pains miraculously disappear. People who use these report terrific results. Dr. Horowitz's video instructions will guide you and enable you to not only produce a single set. You will be able to produce dozens of these discs to sell or give away to your friends and family members as gifts. Entrepreneurs outreaching to health-conscious consumers will love this 'therapeutic art' and opportunity to help people heal. This video is one of four (4) commercially-valuable equipment manufacturing instructional programs featured in Dr. Horowitz's 12-credit hour certified "Frequency Rehab Course" that you might want to take before or after you purchase this instructional program for Chakra Disk manufacturing. 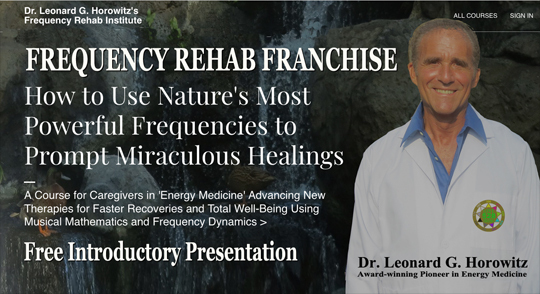 (The total Course trains you to own and operate a virtual Frequency Rehab Franchise in your area.) This is great for natural caregivers and health professionals too. Click the button below to add the Chakra Disk Manufacturing Instructions by Dr. Leonard G. Horowitz to your wish list.